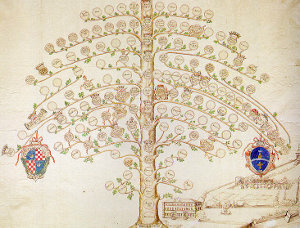 If you search your ancestors in Atripalda, Campania, info about your Italian family are stored in the City Office archives or at the parishes. In towns and villages of Campania and in Avellino province registry offices were established in early 1800: it means that you could find information in Atripalda registrar as of that date. So, if your ancestors were in Atripalda in the nineteenth or twentieth century, then you could try to contact the City Office of Atripalda to know more. Before to start your genealogy research in Atripalda, we suggest you to read our tips for your search . They are useful to search in Campania and in Atripalda too. 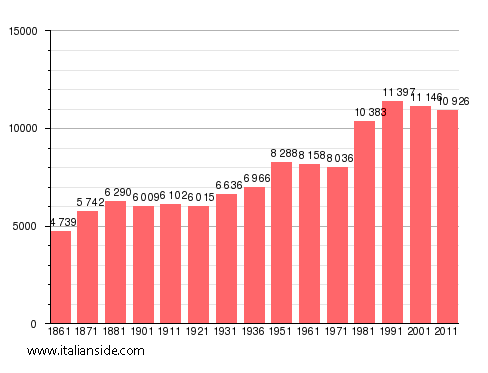 Next picture shows the demographic trends in Atripalda from the Italian Unification (1861) an important info to understand how many people lived there in the past. It could be important to know if the last name you are investigating is a frequent surname in Atripalda. As more your surname is common in Atripalda, as more it could be difficult to find the right info about your ancestors in Atripalda archives if you have not exact dates. If you have the opportunity to visit Atripalda and Avellino province, you could plan to investigate churches’ archives by yourself, but from abroad is very difficult to obtain any result unless you find a reliable local help. If your research is in a dead end and you need professional help from our local Italian genealogists write to atripalda@italianside.com our expert in Atripalda area will study your request and will reply to you with a research plan and a quote. I am trying to get information on my great grandparents. My grandfather is Gaetano Spina (8 February 1881 to 19 May 1956). He was born in Atripalda and died in Philadelphia, Pennsylvania, USA. His parents are Antonio Spina and Rosa Cucolo who I believe are both from Atripalda. Antonio was born on 7 July 1843 and died in 1903 at some point. The only information I have about Rosa was that she died in 1899. Both supposedly remained in Atripalda. I am just trying to fill in gaps about them and possibly identify their parents. Hi , trying to find info on the Cucciniello family. We think that they were from your area. Thank you for any help. You may be able to give. Hello! Looking for more info on my Atripalda family line of Staffa. Originally the name was Andruzolo. Curious to local cemeteries and any ancient graves/markers with the surnames! Thank you! Ciao! Hi. I am looking to see if my ancestors were from your town. The last name is Luciano. My great great grand father’s name is Giovanni Luciano and his wife Angela Luciano (maiden name Monica/Monico). I believe his parents names were Giovanni Luciano anf Delores (or a different name that started with a D). They immigrated to the United States between 1890-1894. Any information would be helpful. Thank you. If you would like to start a research in Atripalda please send your request to atripalda@italianside.com.